A lovely and, I’d like to add, very polite young lad – but why am I writing this article? What’s so special? Scott has a dream. He wants to dance. To be more precise, he wants to be a ballet dancer with the Royal Ballet. Does this sound familiar? ‘A bit like that boy Billy Elliot in the film’ I hear you say. Dreaming is one thing, but Scott is in fact an extremely talented young man. When he was only five years old, he joined UK Theatre School in Glasgow. Three years later, he started taking dance classes at the Jan Sutherland School of Dance in Alexandria, which included ballet, modern and tap dance – and was hooked. When he won the Scottish Junior Song & Dance Championships, Scott knew: he really was on his way. And when he saw “Sleeping Beauty” performed by Scottish Ballet, he was mesmerized. He realized that he wanted to be just like the male dancers on stage. “Adam Blyde from Scottish Ballet is my role model”, Scott told me. He also enjoys singing and being on stage. Scott was in the final 300 out of 7000 boys who auditioned for the role of Oliver for BBC1’s 2008 show ‘I’d do Anything’ in search of new talent to play Oliver and Nancy in the West End production. In November of the same year, Scott appeared in the Apollo Players’ production of Oliver in Glasgow, playing the lead role. 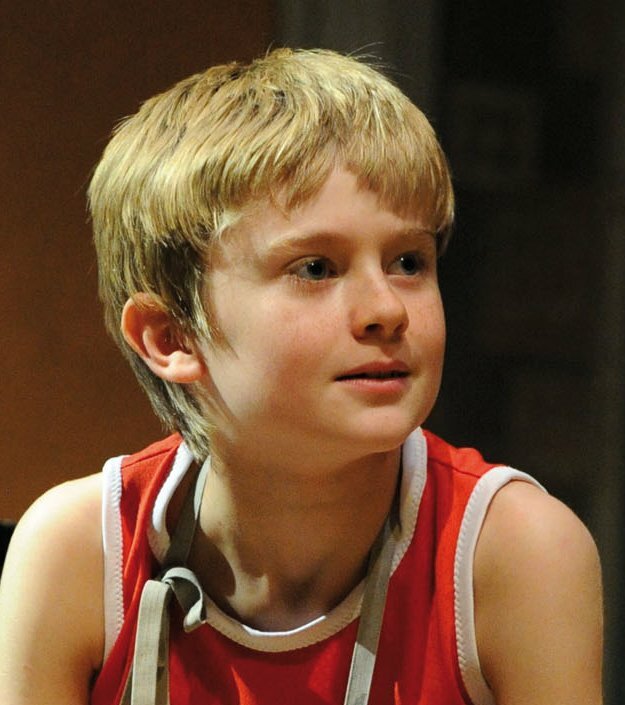 In 2009, Scott asked his parents if he could attend an audition for the role of Billy Elliot, held in Newcastle. Their answer was ‘OK’. Only one boy impressed the judges enough to be asked back the following day – and it was Scott. He started training, hoping to eventually land the role of Billy and worked even harder than before, which included summer school in London. Later that year, he auditioned for ‘Billy School’ and was accepted – that’s 8 weeks of training. Finally, in March 2010 the hard work paid off: he had done it! He became the 24th Billy and made his London West End debut in September 2010. So what’s life like for a ‘Billy’actor? ”We have school every day, followed by rehearsals and a show at night. On our nights off we spend the evening at the Billy House relaxing and watching TV.” Of course he also likes to see other London shows with Jersey Boys being one of his favourite musicals. Scott’s parents Jane and Peter, who I’ve had the pleasure to meet, are very supportive. They have seen Scott perform as Billy over 20 times. “I still get nervous”, Jane admits with a smile that reveals how very proud she is of her son. Of course she knows there’s no need to be nervous at all – Scott may be young but he is very professional. His performance is flawless. Two to three times a week, Scott wows London West End audiences at the Victoria Palace Theatre with his electric performance. 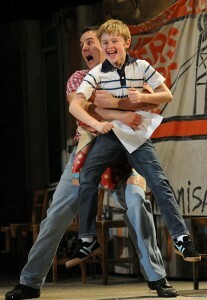 I’ve been lucky enough to see Scott’s interpretation of Billy Elliot twice so far. He’s not the first Billy I’ve seen on stage so I can honestly say that Scott is very talented indeed. His dancing skills are outstanding, his singing is very good and his facial expressions are priceless. If you do go and see the show (and you really should! ), try and sit close to the front so that you can fully appreciate the latter! There’s emotion, there’s passion. Scott makes you laugh (“Expressing yourself” with Michael and a certain scene with Debbie Wilkinson spring to mind here! ), he makes you cry (I couldn’t believe my eyes when there were real tears from Scott in ‘The Letter’ scene), he makes you feel his anger (“Angry Dance”) and genuine happiness (“Dream Dance”). Scott wants to be a professional ballet dancer so I feel that in “Dream Dance” in particular you can see a little bit of Scott himself coming through. He seems to be having the time of his life dancing to the music of ‘Swan Lake’ with ballet dancer Barnaby Meredith (who plays the older Billy), smiling throughout the scene. And in the great finale, well, you just feel good. Scott takes you on a roller coaster of emotions throughout the show. It is a very touching musical in many ways and Scott certainly manages to move the audience whenever he is onstage. And how does Scott like the role? “It’s brilliant!” he told Richard Bacon in a BBC interview at the English National Ballet in March this year. One day, he would love to star alongside Louise Dearman, who is currently playing Glinda in ‘Wicked’ at the Apollo Victoria, only a stone’s throw from the Victoria Palace Theatre. But his ultimate dream is “to be starring in the Royal Ballet’s production of Swan Lake as Prince Siegfried“. There is no doubt in my mind that Scott will succeed. And I really hope that when the time comes, Scott will be kind enough to talk to us again about what it is like to be a principal dancer with the Royal Ballet. And the audiences clearly love you! Thank you for your time and all the best.